Form and function are one in this bottle opener made with copper recovered from Wright's Graycliff estate. 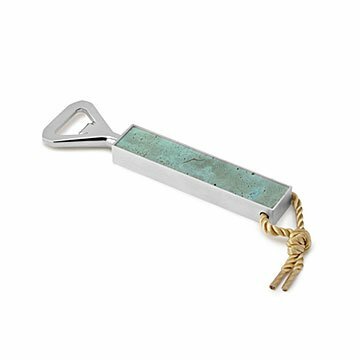 Form and function are one in this charming bottle opener. (Frank Lloyd Wright would be proud!) Made from actual material from the Isabelle R. Martin House, one of three iconic Wright buildings at Graycliff estate, it's an elegant way to pay tribute to the legacy of Wright's work. Each opener contains copper recovered during the restoration of Graycliff, one of the most extensive summer estates ever designed by the renowned architect. Often called "The Jewel of the Lake" for its place overlooking Lake Erie near Buffalo, New York, Graycliff is known for its organic beauty and sweeping scenic views. A fitting symbol for Wright's knack for blending high design and the natural world, the reclaimed copper in the piece's handle contains a rich patina, a detail any architecture buff is sure to love. Handmade in California. I bought this as a wedding gift for a friend who loves Frank Lloyd Wright. I got a text saying "I will send you a proper thank you card eventually but I had to immediately let you know this is the BEST GIFT EVER!". It's probably going to be a display piece instead of being actually used, but she loved it. Great gift for a beer drinker with mid-century modern taste. She was as excited to receive it as I was to give it.